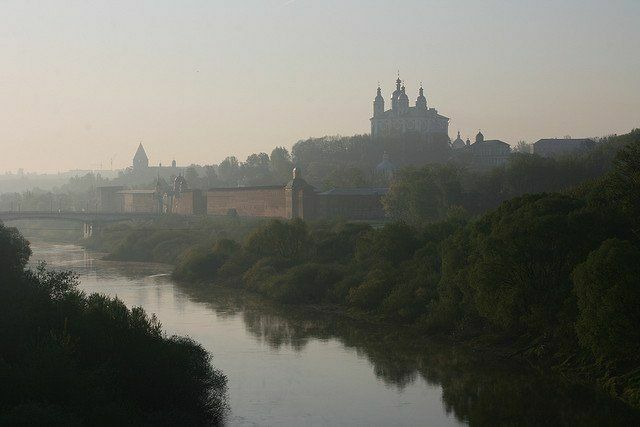 Old Russian city of Smolensk, which is located on both banks of the Dnieper River, known for his chronicles with 862-863 deg's as a union of Slavic tribes Krivichy (archaeological evidence they say about his older stories). With 882 years Smolensk land was annexed to the Prophetic Oleg Russian state. The city and the land has written many heroic pages in defense of our country. He became the main fortress on our western borders, right up to the stateliness Russian war. One of the most recognizable feats of Smolensk — is defense of Smolensk in 1609 — 1611 years. It should be noted that after the collapse of the Old country, Smolensk was returned into Russia in 1514, the stately Grand Prince Vasily III. 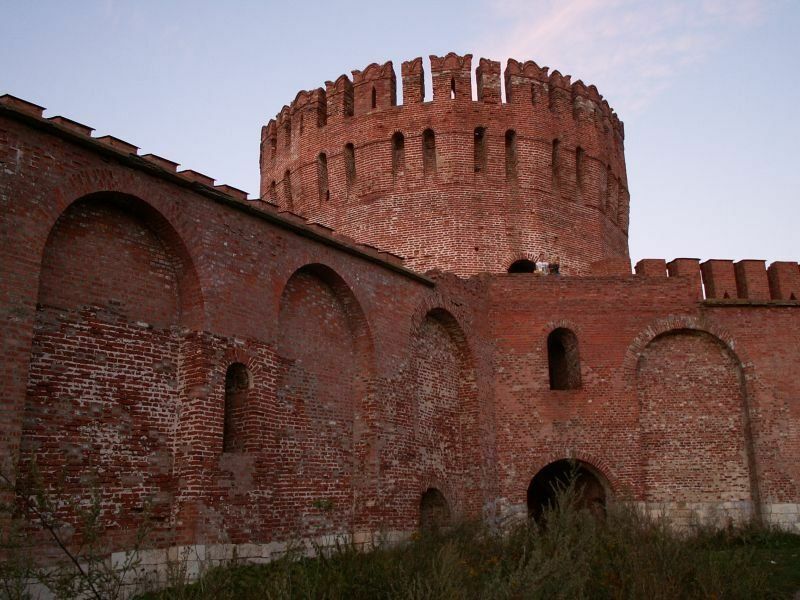 In the years 1595-1602 during the reign of the kings of Fyodor Ivanovich and Boris Godunov under the control of the designer Fedor Stallion was built Smolensk fortress wall, with a length of 6.5 km of walls and 38 towers up to 21 meters. The height of the stronger of them — Frolovskaya, which was close to the Dnieper River, reaching 33 meters. Nine towers of the fortress had a goal. The wall thickness reaches 5-6.5 m, height — 13-19 m, the depth of the foundation of more than 4 m These fortifications played a huge role in the defense of the town. The architect introduced several new products already in the classical scheme for him: the walls are higher — in three stories, not two, as previously, the tower is also higher and stronger. All three tiers of the walls have been adapted for battle: the first tier, for the sole battle — was equipped with rectangular chambers in which squeaked and guns were installed. Second tier was for the middleweight bout — built transheevidnye vaulted chamber in the center of the wall, put the gun in public. Gunners podymali attachable to them on the wood stairs. The upper bout — was at the top of the combat area, which was enclosed with teeth. Deaf and fighting teeth alternated. Between the teeth were low brick floors, because of which the archers could smash his knee. On top of a platform on which guns were also installed, closed boarded gable roof. Troubles in the Russian state was caused by a complex of circumstances, internal and external character, one of her circumstances was the intervention of the Western powers — Sweden, Poland. Poland initially operated by impostors troops of the Polish nobility, who acted on your own risk. But then the Poles and ventured to direct anger, using the fact that Moscow has signed an agreement with Sweden (Vyborg contract). The government has promised Basil Shuya for help in the fight against "Tushino thief", give Korelski county and pay for the services of mercenaries who made up a large part of the Swedish army. And Poland was at war with Sweden, which has become an ally of Moscow. 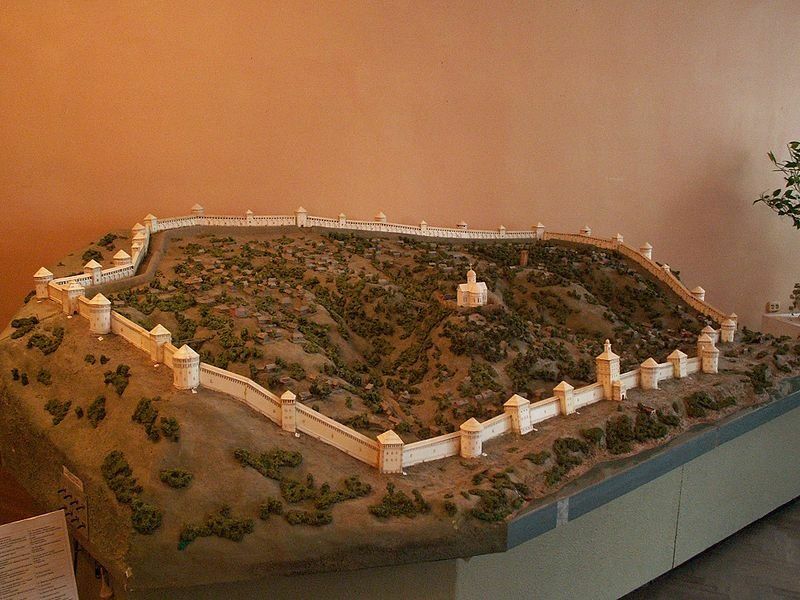 Model of the Smolensk fortress wall. In the summer of 1609 the Poles began military actions against Russia. Polish troops entered the Russian countryside, and the first city on their way to Smolensk was. September 19, 1609 advance units of the Commonwealth, which was headed by Chancellor majestically Duchy of Lithuania Leo Sapieha, came to town and began his siege. After a day or three approached the main forces of the Commonwealth, led by Sigismund III (12,5 thousand people, with 30 guns, the Polish Army were not only Polish, and Lithuanian Tatars, Hungarian and German mercenary infantry). In addition, came up 10 thousand Cossacks, led by Hetman Olevchenko. Polish troops weakness was the small number of infantry, which was necessary for the storming of the fortress — about 5 thousand people. Smolensk garrison of 5.4 million people (9 hundred nobles and knights kids, five hundred archers and gunners, four thousand warriors of the townspeople and farmers), ran the governor Misha Borisovich Shein. He distinguished himself in the battle of 1605, under Dobrynichami when the Russian army defeated the troops of False Dmitry I. Shein, after this victory, he was appointed commander of best regiment in 1607 was promoted to the great men, and in 1608 won one of the most important positions in the Russian state — has become the commander in Smolensk. Voivod had extensive combat experience, distinguished personal courage, firmness of temper, tenacity and aggressiveness, had a wide knowledge of the military. At the armed fortress was 170-200 guns. Then he joined the garrison and inhabitants of the town, the population before the siege of Smolensk was 40-45 thousand (with Posad). Polish ultimatum to surrender Bishop of Smolensk was left unanswered, and deliver it to the Polish messenger MB Shein said that if it is revealed from similar offerings, it "will give to drink the water of the Dnieper" (ie drown). The guns of the fortress provided an enemy with up to 800 meters. Garrison possessed bolshennymi supplies hand firearms, ammunition and food. In the summer of governor began to prepare for a siege, when he received information from the agents that the Polish army would have to Smolensk on August 9. 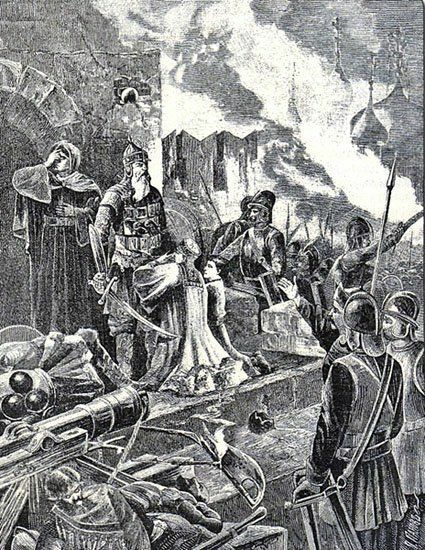 Before the siege Shein managed to score "datochnyh people" (farmers), has developed a plan of defense. According to it, the garrison of Smolensk was divided into two groups of forces: Siege (2 million people) and vylaznuyu (about 3.5 million people). In the siege group included 38 units (the number of the towers of the fortress) of 50-60 warriors and gunners in each. She had to defend the fortress wall. Vylaznaya (spare) group was the general reserve of the garrison, its puzzles were attacks, counterattacks, gain more threatened areas of defense in repelling attacks of the enemy troops. Hetman Stanislav Zolkiewski, specifically managing the Polish army, was a man of common brain because opposed the war from the Russian government. Getman thought she was not in the interests of the Commonwealth. But his friendly reports do not have gained its own purpose. After scouting fortifications of Smolensk and discussion at the council methods of mastering strength Hetman had to report to the King Sigismund III of the Polish army to storm the necessary forces and means (countless infantry, siege artillery, etc.) It is proposed to restrict the blockade of the fortress of the king, and the main force to go to the capital of Russia. f September 25. The plan was to damage the subversive shells Kopytitskie (West) and Avraamievskie (east) gate and through them to break into the Smolensk fortress. For the assault infantry companies were allocated the German and Hungarian mercenaries to break through the gates of the best horse weave. Distract the garrison was to small-artillery fire around the perimeter of the fortress. She had to make the overall appearance of the assault. But Shein, anticipating such a scenario, and all the gates of the fortress were previously covered srubs filled with earth and stones. It protected them from the fire of siege artillery and likely to undermine. Polish miners could damage only Avraamievskie gate, but the troops did not receive a conditional signal before detection. Patrons eastern wall of lighted torches, litsezrev enemy covered fabricate orders to attack with artillery fire. Polish forces suffered heavy losses and retreated. Night attack was foiled. September 25-27, the Polish army tried to take the city, more angry battles were fought in the north — the Dnieper and Pyatnitskikh gate and the west — the Kopytitskih gate. Attacks Poles were everywhere repulsed with considerable losses for them. A huge role in the success of the defense played a reserve, which is rapidly spreading to threatened areas. Defenders of the fortress at once with the defense, improved system of fortifications. The holes were sealed immediately, gates, without which you can do without, covered with earth and stones, log fence in front of the gate covered with a guard. After that, the Polish command decided to weaken the defenses of the fortress with the engineering and artillery fire, and then start the second assault. But the effectiveness of the fire was low, the artillery of the Poles was not much, besides, it's low-powered guns were not able to bring serious damage to the walls of the fortress. Russian garrison fortress artillery inflicted great harm to the Poles, tore engineering training. In this situation, the Polish master was obliged to abandon the re-storming the fort, and from October 5 Polish troops defected to the siege. The siege. Engineering Poles also have gained of success, but are ruled by foreign and spices. Under the foundations of the walls of the fortress were "rumors" (galleries created for forays beyond the fortress and mine warfare). Voivod Shein gave the order to build a more "rumors", to strengthen exploration on the outskirts of the fortress and deploy countermine work. January 16, 1610 Russian miner got to the bottom of the Polish digging and killed the enemy is located there, and then blew the gallery. Some military historians, such as E. Razin, believe that it was the first in the military history of the underground fight. January 27 Smolensk miners won another victory over the enemy, the enemy blew up a tunnel. Soon Smolensk could undermine the Polish mine once, proving the futility of doing against their mine warfare. Russian warriors won the underground war winter 1609 — 1610 period. It should be noted that the Russian garrison not only successfully repelled the enemy attack and won mine warfare, and commit attacks in which involved hundreds of soldiers, not giving the opponent a measured plaguing. In addition, the attacks committed in order to obtain water in the river (in the fortress it was not enough, or the water quality was poor), for winter firewood. During one of the raids 6 Smolyan fled by boat across the Dnieper, slipped unnoticed to the Polish camp, captured the royal standard and safely returned to the castle. The Smolensk turned guerrilla struggle, which is not surprisingly, given the nature of the European armies since — due to the supply of the local population, looting, violence against people. Guerrillas very disturbed enemy by attacking his foragers, small units. Some groups were very numerous, as it was in the squad Cod to 3 thousand people. Assist in the organization of guerrilla outstanding Russian military commander since the Troubles — MV Skopin-Shumsky. He sent in Smolensk three 10-ka military professionals to form a guerrilla units and disrupt the rear of the Poles. The siege of Smolensk held down a large part of the army of Poles, it allowed MV Skopin-Shumsky make a number of victories against the enemy were cleared vast areas in the north-west of the Russian country was eliminated Tushino camp False Dmitry II. And in March 1610, managed to free from the siege of the capital. But a month later with a little after a triumphant entry into Moscow, the young professional military commander, widely predicted in the reign of, suddenly passed away. He was killed in the period when preparing vigorously campaign for the liberation of Smolensk. The young captain was only 23 years old. Command of the army was transferred to his brother Tsar Vasily Shumsky — Dimitri. 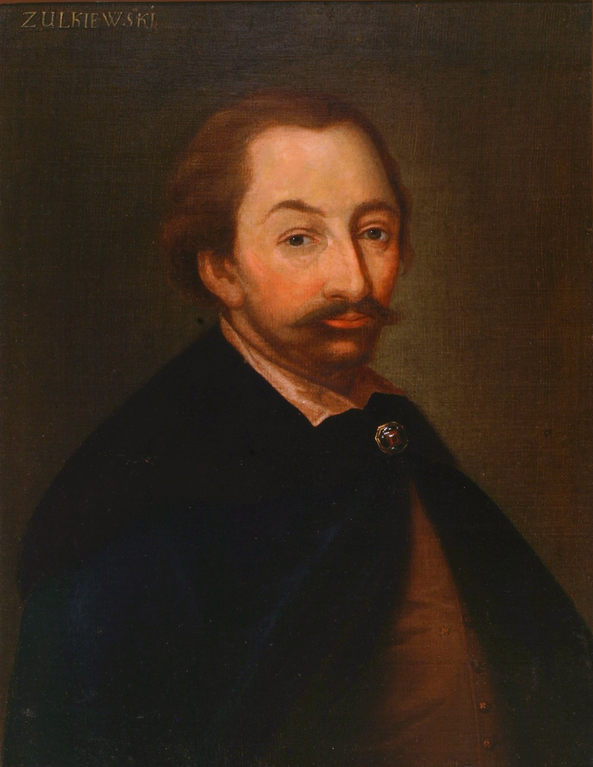 In May 1610 Russian-Swedish army (about 30 million people, including 5.8 million Swedish mercenaries), led by DI Shuiski Jacob De la Gardie and acted in a campaign to liberate Smolensk. Polish lord did not shoot the siege and sent towards the Russian Army 7 th Corps under the command of Hetman Zolkiewski. June 24, in the battle near the village of Klushino (north Gjatsk) Russian-Swedish army was routed. The reasons for the defeat was caused by mistakes of senior officers, the total lack of talent personally D. Shumsky, betrayal at a crucial moment in the battle of foreign mercenaries. Ultimately Zolkiewski captured baggage, treasury, artillery, the Russian Army almost completely scattered and ceased to exist, the Polish army intensified 3 thousand force of mercenaries and 8 thousand Russian squad governor G. Valuev, sworn Prince Ladislas. Mode Basil Shuya was a terrible blow, and the king was overthrown. Boyarskoe government — "Seven Boyars," acknowledged the power of the Polish Prince. The position of Smolensk became hopeless, hope for help from outside dropped. The situation continued to deteriorate Smolensk, but the siege, starvation, and disease did not break the courage of urban residents and the garrison. While the defense force ebbed, and there was no help to the Polish army were coming more and more reinforcements. In the spring of 1610, the fortress came under Polish troops who had served previously second impostor. Approached and significant forces of the Commonwealth. Total Army received 30 thousand reinforcements and siege artillery. But the garrison was not going to give up, all attempts to persuade the Poles to surrender Smolyan of success were not (offered to surrender in September 1610 and March 1611). In July 1610, the Polish army resumed active engineering work, immediately began to use the resulting siege artillery and battering mechanisms. Polish engineers laid the trench and began to move to the tower at Kopytitskih gate. Garrison led the trenches to counter the enemy's advance and were able to kill the part of the opponent moves. While the Poles have gained all the same tower, but all attempts to make a dent in its massive foundation of success had not. pulsed the attack. The decisive role played spare units that fit to enter into battle. The fierce battle was August 11, the defenders repelled the third big storm. The Polish army has lost up to 1 million people were killed only. November 21 garrison repulsed the fourth assault. Major role in repelling the enemy again played a reserve. The Polish army suffered significant losses and re-defected to the siege, without taking action. Winter 1610-1611 years was very difficult. To famine and epidemics, weakens people joined the cold, people to collect wood for the attacks was not enough. Began to be felt and the lack of ammunition. In the end, the beginning of June 1611 in the garrison fortress survived only two of hundreds of people who were able to keep the gun in his hand. This number just enough for perimeter surveillance. Of the inhabitants of the town remained alive at least 8 thousand people. Apparently, the Poles did not know about it, and then the storm would start earlier. The decision on the fifth assault Polish command decided only after a defector from the fortress, some A. Dedeshin, spoke about the plight of Smolensk. He pointed to a place and a rather weak defense of the fortress in the western part of the Smolensk wall. In the last days, before the final assault, the Polish army subjected to strengthen massive bombardment. However, its efficiency was low, a small gap could break in just one place. In the evening on June 2nd Polish Army prepared to assault. She was able to complete an advantage. At midnight, the troops stormed. In the area of the gate Avraamievskih Poles could inconspicuously on scaling ladders to climb the wall and break into the fortress. At the point where the hole punched in the wall, hundreds of German mercenaries met the small group (a few 10 s of soldiers), led by warlord Shein. In fact, an angry battle they laid down their heads, but do not give up. Shein himself was wounded and captured (in captivity, he was tortured and then deported to Poland, where he was imprisoned for 9 years). The Poles broke into the city and to the west by undermining part of the wall. Despite the desperate situation, Smolensk did not give up, they continued to fight in the town, a ruthless struggle on the streets was all night. By the morning of the Polish army captured the fortress. The last defenders retreated to the Cathedral hill where stood the Cathedral of the Assumption, had taken refuge there to 3 million urban residents (in the main old men, ladies and kids, because the men were fighting with the enemy). In the basement of the Cathedral of gunpowder stored supplies of the garrison. When the last heroes defending the Cathedral hill fell in the unequal struggle and brutalized by fighting mercenaries broke into the cathedral rang a terrible explosion that buried the city's residents and opponents. Obscure Russian patriots prefer death captivity … an unprecedented 20-month defense ended on the highest note. Russian garrison fought to the end, having exhausted all the defensive abilities. What has not managed to make an enemy, did hunger, cold and disease. The garrison fell in battle in full, of the inhabitants of the town, survived a few thousand people. — The Russian people was yet another example of how to live and fight to the end, regardless of the sacrifices and losses. Their unshakable perseverance, courage inspired all the peoples of the Russian country to fight the aggressors. — The Polish army bloodless (general loss of up to 30 thousand people), demoralized was not able to throw on Moscow and Sigismund III did not dare to go to the Russian capital, took him to Poland. — The defense of Smolensk has played a huge military and political role in the struggle of the Russian country for its existence. Smolensky garrison, the inhabitants of the town of nearly two years, held down the main forces of the enemy, disrupt his plans for the occupation of the actual principal centers of Russia. And this made the conditions for a successful national liberation struggle of the Russian people against the invaders. They fought in vain. — From the perspective of the military defense of the Smolensk fortress of art is a traditional prototype defense fortified position. It should be noted that it is not a bad preparation for the defense of Smolensk assist its comparable small garrison without any outside help, relying only on their own strength and resources, successfully withstand the assault of 4, a substantial number of small attacks, the siege numerically superior enemy army. Garrison not only repelled the assault, but was able to so deplete the strength of the Polish troops, even after the capture of Smolensk, the Poles lost their offensive power. The heroic defense of Smolensk indicates the highest level of the Russian military art ever since. This was evident in the highest activity of the garrison, stability defense qualitative use of artillery, the victory in an underground war against the Western military professionals. The command of the fortress maneuver skillfully used the reserve, without annoying improved the defense of Smolensk during the conduct of hostilities. Garrison showed the highest morale, courage, quick-witted mind until the very last moments of Defense. — The fall of the fortress was justified in the errors of the garrison, and the weakness of the government's Basil Shuya, a direct betrayal of the public interest of the Russian elite of the country by individual groups, a number of mediocrity royal commanders.